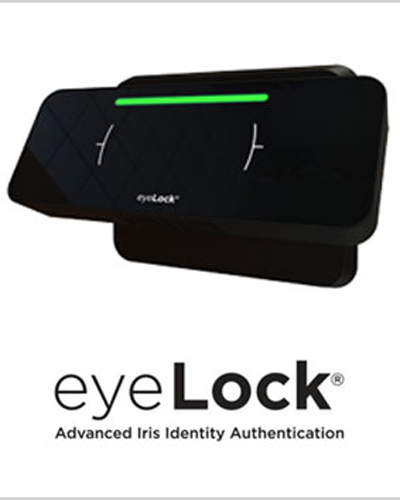 iTel is the market leader in offering "Advanced Iris Identity Authentication" solutions in the MENA Region, through its Partnership Agreement with EyeLock (USA Made Technology). 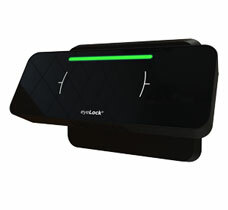 The EyeLock Identity Suite Centralized Management Application (CMA) streamlines administration of EyeLock devices and users. The browser-based CMA simplifies firmware updates, provides the ability to simultaneously manage multiple device settings and remote device diagnostics for online and offline devices. 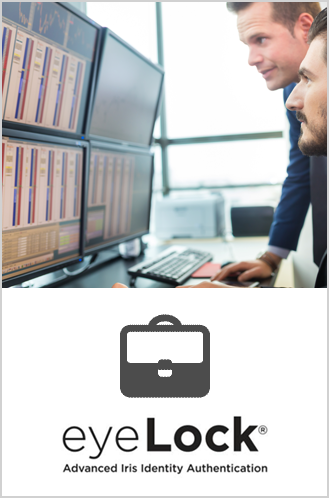 The CMA turns any networked PC with access to the Identity Suite server into an enrollment station– a convenient solution for enterprise organizations with multiple geographic locations. 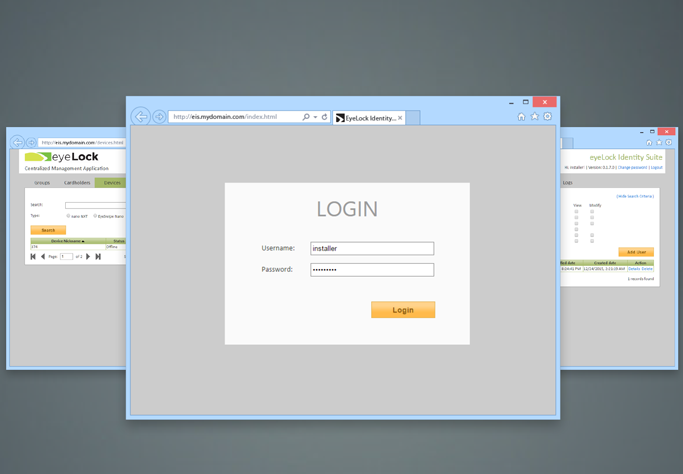 When configured, the included Active Directory integration allows users to take advantage of Single Sign-On (SSO) using their existing Active Directory domain components. 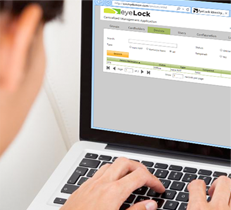 In order to maximize efficiency of existing access control systems, the optional Core Integration component of the EyeLock Identity Suite can be implemented to enable a quick, error-free enrollment process. During iris enrollment, cardholder data is pulled directly from the access control database, eliminating time and the opportunity for data entry errors. Once enrolled, data is kept in sync, simplifying the administrative process. 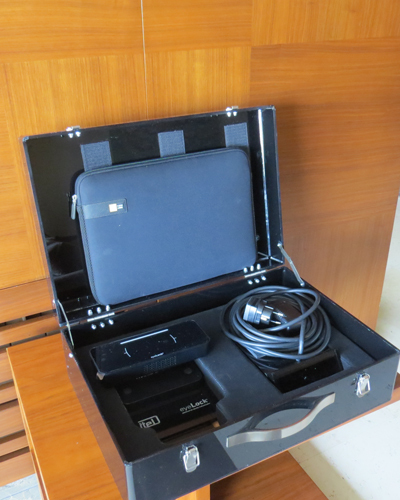 The Identity Suite also enables intelligent onboard memory management within the iris readers. Utilizing an individual’s access control permissions, the system is able to determine and distribute iris templates only to doors which are necessary, maximizing the industry-leading onboard storage of 20,000 iris templates. Imagine being able to quickly and accurately authenticate people. Imagine implementing advanced security while increasing convenience and reducing management costs. 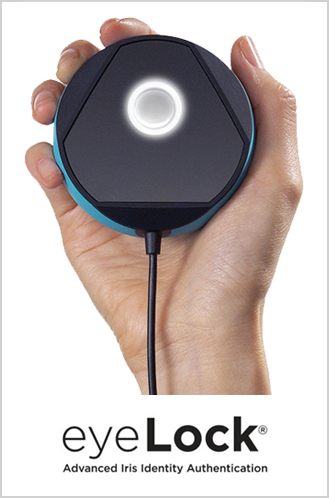 Introducing the nano NXT - the next generation of EyeLock's revolution - ary access control solutions. nano NXT renders all other access control peripherals obsolete by revolutionizing how identities are protected, authenticated, and managed. 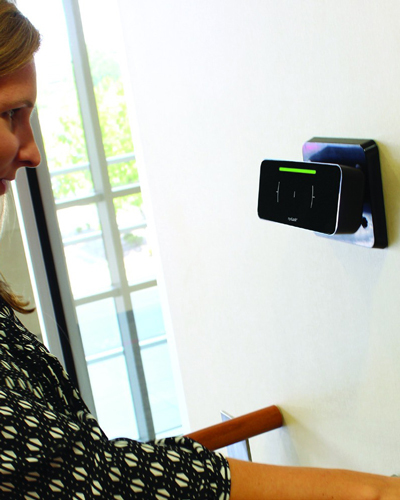 With a sleek low profile and powerful capabilities, the nano NXT redefines the future of access control. An optional SDK is available to customers who want to customize their security solutions to integrate seamlessly with existing applications. 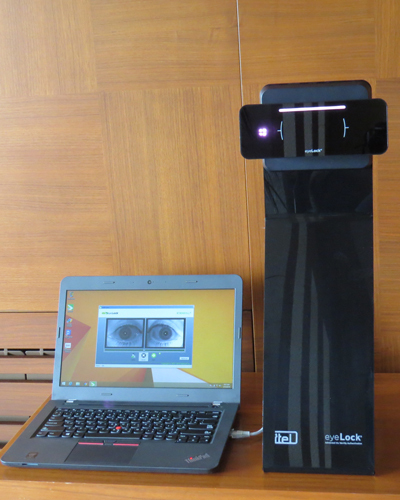 The nano NXT authenticates up to 20 people per minutes, in-motion and at-a-distance with unparalleled accuracy. 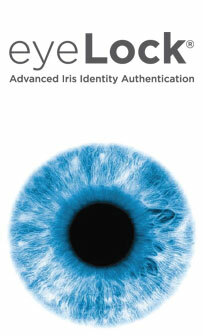 HBOX is an over-the-door iris-based identity management system. 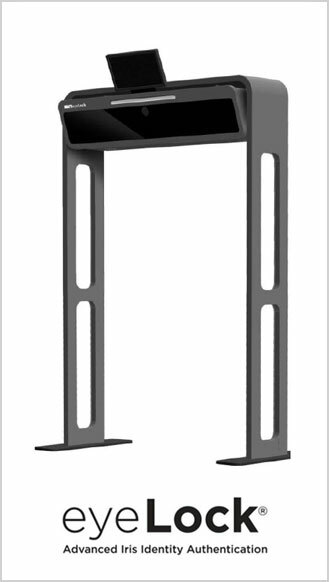 Our flexible design accommodates multiple mounting environments from mobile stands, fixed frames and wall mounts to new construction and existing retrofit configurations. HBOX throughput delivers up to 50 people per minute and is ideal for environments such as airports, stadiums and construction sites. 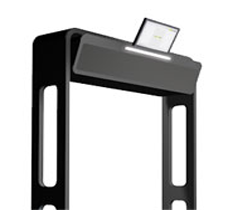 The device easily integrates with all industry standard access control platforms and serves as an electronic physical access control system. 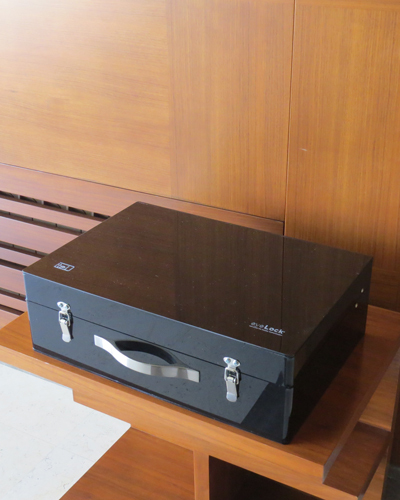 The robust HBOX system hardware is complemented by SAMBI® (biometric acquisition) and BioTag® (biometric matching) software, delivering a self-contained end-to-end solution. 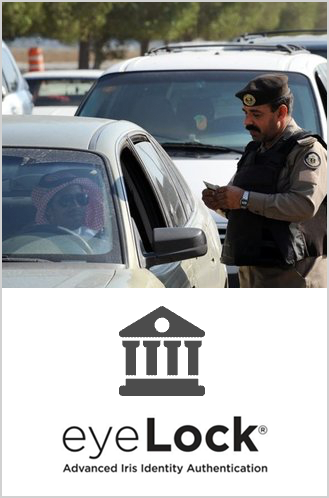 The most convenient and secure way to authenticate your identity. Never type a password again—myris is a USB powered Iris Identity Authenticator™ that grants you access to your digital world. It’s portable, lightweight, fits in the palm of your hand — and is as easy as looking in a mirror. myris uses patented technology to convert your individual iris characteristics to a code unique only to you, then matches your encrypted code to grant access to your computers, websites, applications and data — all in seconds. myris works easily with digital networks, including online accounts, social media accounts, Internet VPNs, email and more. On the back end, you can set passwords as complex as you like. Once you link myris, you can forget them. Use myris to secure workstations, high-value transactions, critical databases, information systems for enterprise and small business and more. As with all EyeLock identity authentication solutions, when you purchase myris you also receive our enrollment and iris-matching software. For enterprise customers, you can upgrade your product offering by utilizing EyeLock’s robust SDK to integrate seamlessly with digital platform environments. • Full time tracking for your employees and Workers. • Simplified User Interface with Ease of Use. • User Defined Time Out Interval to avoid same consecutive logs. • Reports Generation in multiple formats with direct printing option. • Ability to retrieve the data of multiple or single personal logs. • Structured to reflect the employee’s classifications hierarchy. • Automated shift matching algorithm makes it easier to manage employees and their working hours. • Multiple canned reports generated on any range of time (Monthly, Weekly, Daily…etc.). • An option added to show or hide any column in the report. • Filters the report based on several variables (Name, Person ID …etc.). • Shows separated and continuous logs. 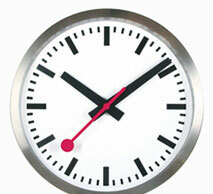 • Shows precise time interval of working hours. • Sorting data with different columns. • The ability to select the required number of rows to show up. 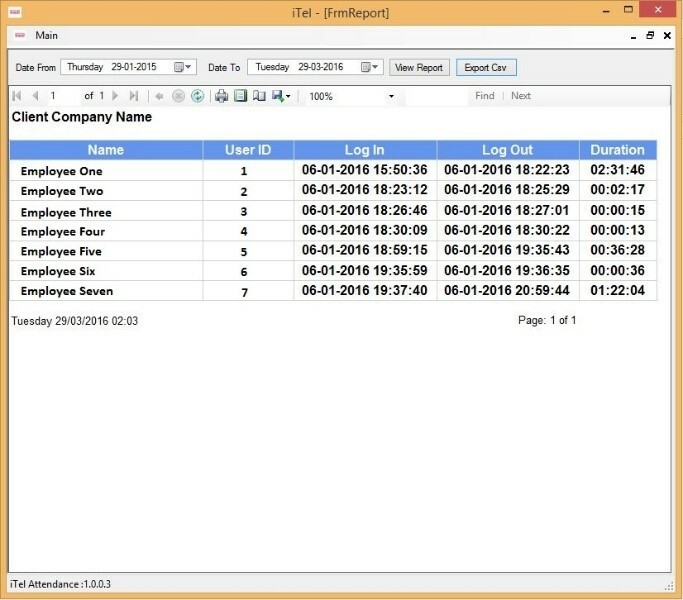 • Export the report in Excel and PDF formats. iTrack™ Advanced supports multiple companies with multiple structures. Each company can have its own hierarchy and the employees will be linked to their corresponding departments, employee ID or any related variables. Designed to be neat, both iTrack™ Essential and iTrack™ Advanced are presented to the user in a simple layout with clear commands and buttons to allow efficient manipulation of the application . iTrack™ Reports can be easily fed into your existing payroll and HR system to minimize duplication of information. Daily, Weekly and monthly reporting of attendance records in multiple formats with calculated total time worked on every shift. 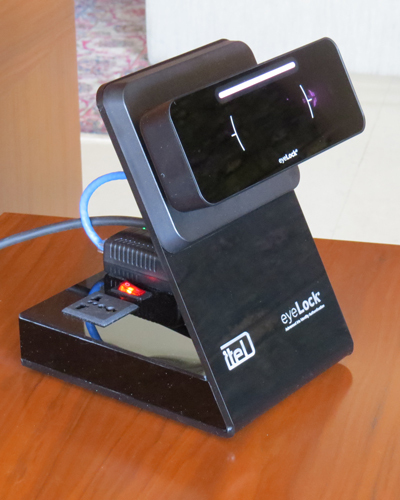 iTrack™ is fully integrated with iTel’s Advanced Iris Authentication solution from EyeLock. Through of the efforts exerted by the different ministries preparing for the introduction of modern technological equipment in order to improve their administrative performance particularly in the fields of security and safety, we are pleased to present our product from EYELOCK, an American company represented by Itel servicing the Middle East region and the Gulf, which is a revolution in the world of the advanced Iris identify authentication bio-based solutions. Fast – No other technology can deliver high accuracy authentication in real-time. 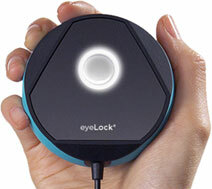 Eyelock’s products are the most advanced iris-based Identity management and access control solutions in the market. The broad range of products and proprietary competitive advantages have completely transformed the biometrics marketplace. Through of the efforts exerted by the different institutions preparing for the introduction of modern technological equipment in order to improve their administrative performance particularly in the fields of security and safety, we are pleased to present our product from EYELOCK, an American company represented by Itel servicing the Middle East region and the Gulf, which is a revolution in the world of the advanced Iris identify authentication bio-based solutions. Passwords and magnetic card tokens are routinely forgotten, lost, shared and stolen. • Biometrics are technologies that automatically confirm identity by comparing patterns of physical or behavioral characteristics in real time against enrolled computer records. • Biometrics help protect privacy by erecting a barrier between personal data and unauthorized access. 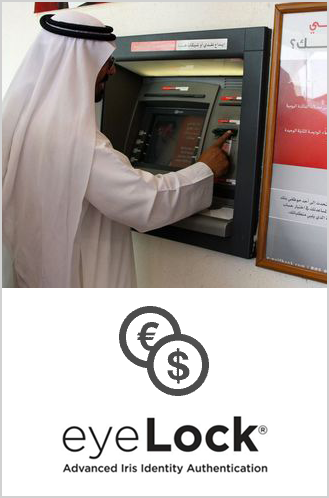 • Cardless Banking Application - "No Card/No PIN"
iTel offers advanced national information security solutions, thru its Exclusive Representative of I&I Strategy in the MENA Region. 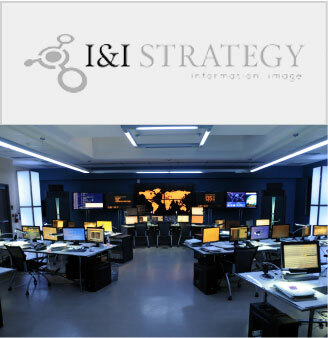 I&I Strategy develops and provides advanced cyber security products and services, which allows National Security services achieve cyber risk management and mitigation. “Without the right tools and skills, improving your country’s digital protection and resilience is a huge task.